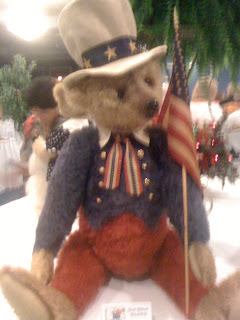 "God Bless America",was by Sharon Barron and it placed 3rd in over 12"at the awards. 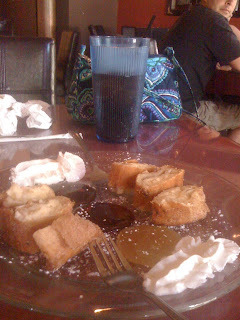 Artist Donna Griffin and I went to lunch at the "Lost Dog" and shared desserts. She got the Cheesecake in this wonderful pastry with three dipping sauces, chocolate, strawberry and caramel. 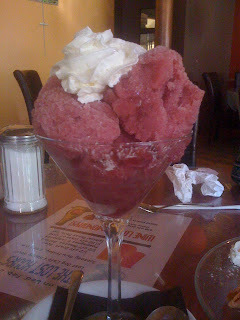 I had the blackberry sorbet and it was oooh, just can't tell you how good it was! 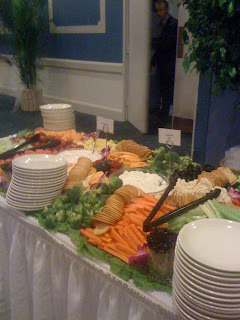 And this is just a sample of the appetizer's at the reception on Thursday evening. Trust me, you eat well at this show! 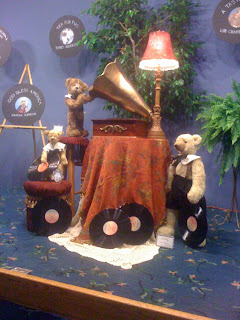 And this was part of the stage decorations for the show, the brainchild of artist Penny French whose gallery piece, "Winter Wonderland" placed third in vignette category.